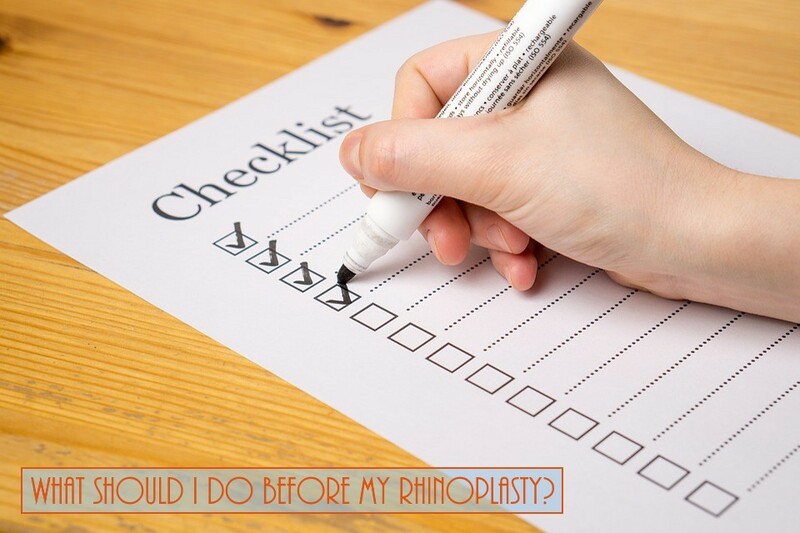 Home > Blog > What Should I Do Before My Rhinoplasty? Stop Taking Aspirin - It is important to discontinue the use of any aspirin, ibuprofen, vitamin E, and herbal supplements two weeks before and two weeks after your rhinoplasty surgery. Aspirin is a non steroidal anti-inflammatory drug, which affects platelet function. Despite platelet count being correct they do not function correctly. The process of regeneration usually takes two weeks for the bone marrow to generate new platelets to replace the affected platelets. Prescriptions - Don't forget to stock up on your prescriptions, you don't want to run out when your in the recovery stage of your procedure and you can't do much. If your surgeon has given you any prescriptions for pain relievers to take after your surgery, fill those prescriptions before you go in for the procedure as well. Supplements - Supplements before surgery can be a tricky subject. Some supplements, such as certain herbs or vitamin E, can increase bleeding. Either at your consultation or at some point a few weeks before your procedure, make a list of all the supplements you take and show it to your surgeon. He will let you know which ones you should stop taking before the surgery and when it is safe to start taking them again after the procedure. Your surgeon may also recommend that you start taking certain supplements, to help reduce bleeding or swelling or to generally improve the healing process. For example, some surgeons recommend taking arnica after the procedure, as it can help reduce swelling or inflammation. Other vitamins your surgeon may recommend include vitamin A, vitamin K and bromelain. Only take supplements as recommended by your surgeon or after getting the go-ahead from your surgeon. Home Prep - Set up an area of your home to rest and recover in, whether it’s a chair in your living room or your bed. After rhinoplasty and other facial surgery, you’ll want to keep your head elevated, so make sure there are enough pillows to prop you up.